Our elders taught us that honesty is the best policy but in work life, you cannot be honest every time. There are the days when you just don’t feel like going to the office but can you say that to your boss. No! If you do that be ready to bid adieu to your dream job. So it is better that you justify your off. 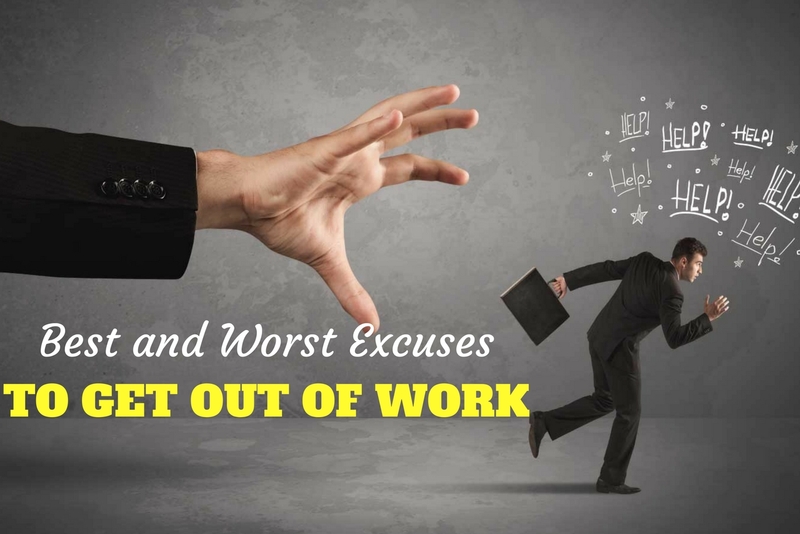 So in this post, we will explore some best excuses to get out of work and also some other ideas which are involved while taking an unplanned off. Below is the timeline. Innovation is not only required for getting successful in office but also in taking a day off. So let us seek out some pretexts which can be life savers. Despite the fact that it is all right to bunk the office once in a blue moon and stay back to read, watch a movie, plan a get-together or for some other reasons which cannot be explicitly told to your boss but if you fail to give a perfect excuse, you may spoil your rapport or even worse. Following are some best reasons for laying your mind and body off the office boundaries. With lowest trembling voice, you tell your boss that you are down with contagious flu or cold. As a mark of having the sense of work ethics, you do not want to spread the infection to the fellow employees and to him. You have to convince him that you are genuinely ill so try using shorter sentences because for an ill person speaking is also a hard task. This will make him think that you cannot be productive when sick and if you come, it would rather cost the organization in terms of other employees also falling ill.
Tell your boss that you have food poisoning and if you come to the office you are going spend most of the day in the loo. To sound more convincing you can try calling your boss from the loo and flush while you talk. Fake the sound of vomiting as you are just going to vomit. Your boss instead of giving a day off will give you two day off. Depending upon your condition you can say that you have an appointment with your lawyer or a bank manager or a chartered accountant or other similar types of official who generally works on weekdays only. To make the excuse true you can take an appointment deliberately and take a day off. A small apology saying you took the appointment and forgot to inform, along with notification of the appointment can aid you in bunking the office with ease. If your home is quite away from your office you may give an excuse that your car/bike is not starting and now you have to take it to the garage for getting it repaired. All this would take a lot of time and you will not be able to make it to the office. Nothing in this world is more important than your kid so you may justify your absence in work by telling that your kid is sick. Although saying such a lie for our own kid hurts the self-conscious but you may balance that by giving the day to your kid and enjoy with your little one. Both of you will be overjoyed at the end of the day. Most of the offices are quite tolerant regarding this issue. You may explain to your boss that there is a contingency in your family and one of your family member or relative is in the hospital. You have taken the responsibility of taking care of everything in the hospital. Your boss will never question your absence hearing this. Your story would be like, “I had bearable pain in my tooth from a week and kept on ignoring but today it just became unbearable and even can feel the tremors of pain in complete jawline and brain. I will go to a dentist and get the treatment for this pain.” Your voice should speak volumes of agony to support the story of pain you are telling. With little bit acting you get a treat for yourself. Your vehicle met an accident and you were saved with just few scratch. This can be an excuse but be careful to choose the scratch places which are mostly covered like knees or above the elbow. To safeguard yourself from being caught hold strap a fake bandage on you knee or other part described in your story. If in case, your boss asks to show the bruise then you can show the bandage. Also, do not take your car/bike for a week or so. Unless your employer is too inquisitive, he would not question your alleged reason of being deeply depressed by a personal problem and needing a day to calm yourself to get back to work. Actually, stress is the biggest rival of productivity, thinking in that context it is considered to better allow some mental rest to the employee. But you should use this excuse rarely as it can degrade your goodwill. You came out of your house and with the flow of the wind your door automatically closed with keys also locked inside the house. Now you have to call a keysmith for making a duplicate key and this process would take a lot of time. When you tell this sad tale to your boss, you will get an off without much ado. If you have the history of a migraine you can make this excuse. The pain of a migraine is horrible so your boss will completely be sympathetic towards you. Above that, he deems that if you come to the office when you are having a migraine, you will be more a liability than an asset and would spread your irritation all around. Female employees can make their leave justified by telling their boss that you are getting severe cramps due to periods. If the boss is female she would understand and if the boss is male, menstruation being a taboo topic he would not argue over this. The best part is you can never be caught while making this excuse. When you defense your off, against your baby’s safety, it will always be accepted. But don’t forget to feel extremely sad about missing the office because of the babysitter. Just show on the call how willing you were to come to the office and when you were all set to come then babysitter denied coming. On the way to the office you have been pickpocketed, that is the reason you had to rush back home and do the needful actions for barring the ATM or other documents. This explanation of missing your office can be given just once. Also be sure that you conceal the cards that were lost as per the story you told to your employer when you head to the office next day. Give a call to your boss and in the most painful voice ever, tell him that today while taking bath you slipped in the bathroom and you sprained your ankle or your back. Now you have so much pain that coming to office seems next to impossible. Enjoy your day and next day when you go to office keep your movement restricted to upkeep the lie. You may give any of the above-mentioned whys and wherefores for not going to the office but the key to success is the expression. So while giving a fake excuse, remember to fake your voice too and express the emotions through your voice. Following is the list of not so good reasons which you may give but how well would it be accepted by your boss, is the point of consideration. If you have a good track record and your employer values your performance, then it may be good to be honest to your boss. Seeing your credibility he would not mind to give an off. This way you are safe from being caught and spoil your rapport. In other cases, when you have to give an excuse, try being genuine. Attempt being simple and brief, the more you complicate the bunk story, more you have the chances of forgetting the exact version you cooked up in future. Also, don’t try to explain a lot, because there is a general belief that those who lie need to validate their actions with many things. Don’t delay in floating the information about your absence. Additionally, follow the policy of your workplace for taking a leave, which includes, calling in the office or circulating an email or other. Enjoying on a weekday can be a good idea once in a while but this short term pleasure can give you long term pain if you get caught. So never forget a point that however good the reason may be for shunning the office for a day, you have many chances of being caught and that can be seriously damaging to your career. But employees are daredevils, a report revealed that around 35 % of employee take sick leave when they are actually in good health. Is that a good reason to lie? Read further. Worst of all, you may lose your job. Your social media platforms can spoil all the game. So if you tell a tall tale to your boss, do not ever update on any social media platforms about a reunion with your friends or other interesting activities in which you engaged yourself on that day. A career survey found out that in 35% of cases where the employee bunked office against sick leave were caught by their boss on social media. It doesn’t matter that your boss is in your friend list or not but the fellow workers you added can blow the golden dust you laid over your off. In the end, we would say that taking a casual off is not a crime. But be thoughtful about the explanations you give to your employer, like declaring a family member dead for bunking can be scary (obviously who wants to see a ghost alive) as well as heavy on self-conscious. The final call is yours.